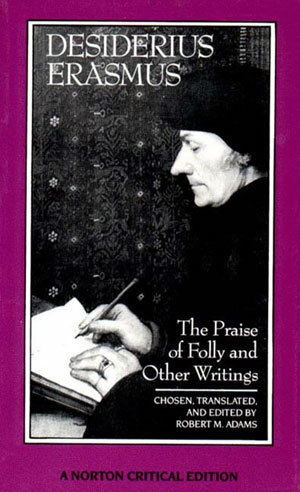 The Praise of Folly and Other Writings - Description | W. W. Norton & Company Ltd. This Norton Critical Edition provides a wide selection of Erasmus’s writings, translated from the Latin into fresh, modern English. Besides the celebrated Praise of Folly, Robert M. Adams has included the political "Complaint of Peace," the brutal antipapal satire "Julius Excluded from Heaven," two versions of Erasmus’s important preface to the Latin translation of the New Testament, and a selection both serious and comic of his Colloquies and his letters. Adams has made these selections to emphasize the humane, rather than the doctrinaire, side of the first and arguably greatest humanist. Critical commentary is provided in essays by H. R. Trevor-Roper, R. S. Allen, J. Huizinga, Mikhail Bakhtin, Paul Oskar Kristeller, and Robert M. Adams. Also included are a Chronology of Erasmus’s life and a Selected Bibliography.